This is an individual assignment, not a pair assignment. If you turn in the assignment on paper, include the usual log questiions (other than the partner ones). If you turn this in online, include the log comments in log.txt (minus the partner part). You may write it on paper and scan it before uploading online. (5 points) Create circuit diagram for the Boolean expression (AB + C)D.
Remember wires only connect at dots. (5 points) Write a Truth Table for the Boolean expression (A+B')C. Include columns for the inputs A, B, and C. Please include a column in your truth table for the output of each intermediate expression. Include rows for all 8 combinations of input variables. 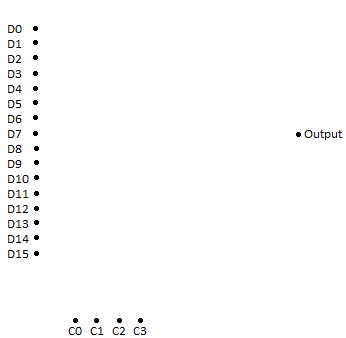 (5 points) A three-way majority circuit is one with three inputs and a single output which is set to the majority value in the input (1 with two or more 1 inputs; 0 with two or more 0 inputs). With three inputs there are eight possible combinations for the input settings. Please give a truth table which lists rows for all eight input combinations along with the output setting for each case. (5 points) Write a Boolean expression for the output of the three-way majority circuit from problem 4. (5 points) Construct a circuit which implements the three-way majority function discussed in the previous two questions. You may use AND and OR gates with more than 2 inputs to make it easier. Submit in Sakai. (Include the extra credit portion below if you like.) You have presumably drawn some pictures. If they are on paper, scan your work into a computer computer file. You will need to submit a modified log.txt (no reference to a partner). Interestingly, any given boolean function can be calculated by a circuit consisting solely of NAND gates. Create a circuit, using only NAND gates, which has the same overall behavior as a NOT gate. Your circuit should have one input and one output . Create a circuit, using only NAND gates, which has the same overall behavior as an AND gate. Your circuit should have two inputs and one output. Create a circuit, using only NAND gates, which has the same overall behavior as an OR gate. Your circuit should have two inputs and one output.